It amlost a year, but Many Miniatures has just revealed it's new look and boy is it different. Gone is the light blue background and static menus. Now you can navigate the site from every page and it's all on a clean white and blue background. We have also spread out internet present to Facebook, Twitter and soon on YouTube. We invite you to follow and contribute there as you have to our Photo Gallery. See new specials and videos and hear about the behind-the-scenes goings-on at Many Miniatures. Speaking of special deals, from January 20th until March 21st we are taking pre-orders for the President Obama Set, coming out in May. When you pre-order the set, you get 25% off the regular $10.00 price. So be the first on your block to have President Obama in your collection. And, as usual, you can find all the retired figures on our Ebay Store, which is going to experience its own growing pains to bring it's design in line with the main site. Times are changing and so is Many Miniatures. We are in the middle of a major overhaul of the way we look and function. It began when shipping prices went up. We responded with our annual price increases and adjustments, followed by the removal of old, retired figures (which can still be found on our Ebay Store). We began adding our new stock and updated models, giving us new versions of the Ewe and Lambs, St Bernard, Cats and Kittens, Turkey, Haflinger Horse, Lion Cubs and Tiger Cubs and more. We also welcome the addition of the Gnu/Wildebeest, Mule, various Extinct Mammals, new Chickens and Chicks, Frogs, Lizards, Turtles and new People Figures, along with a returning favorite, the Puffin. We continued to try finding the best looking figures for the best prices. 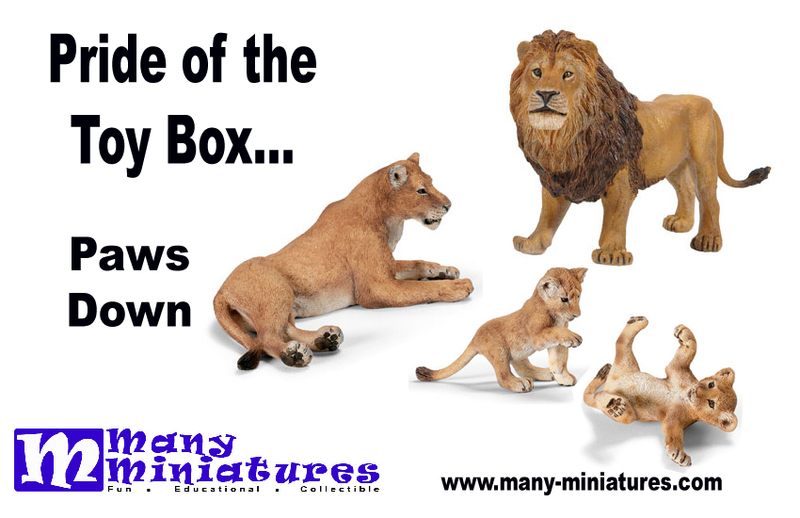 This lead us to find the CollectA figures a newer competitor with a variety of animals that will knock your socks off. Unfortunately we had to say good-bye to out Canned Critters and our Mini Clip Birds. Their sales slid as people no longer clung to their novelty. Alpha's Fuzzy Town went out of business and We moved our Sound Prints collection to Special Orders and Charity. In the days and weeks ahead we hope to expand our offerings in collections for School Projects and Displays as well as finding more Historical Figures and Mythical Creatures. So, keep up with our big announcements here, catch out tweets on Twitter, search for our bargain sales on Ebay, and look for our expansion into the internet on sites like Facebook.